Just when many pundits had counted the Kenya national XV rugby team out, they managed to pull off a surprise 19-13 win against arch rivals Uganda in Kamapala. 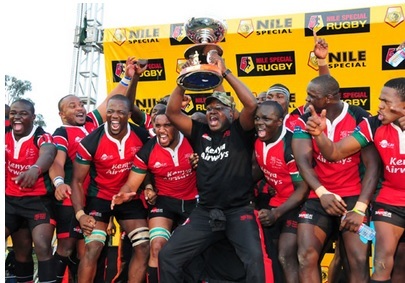 The win enabled them to lift the Elgon cup which Kenya had surrendered to Uganda in 2012. Having lost the first leg in Nairobi by a score of 17-16, it seemed highly unlikely that Kenya would reverse the score in Kampala. To begin with, it was the second successive time that Uganda had beaten Kenya after they beat Kenya at the 2012 Africa cup. Secondly, matches between Kenya and Uganda typically favor the host. Indeed Kenya had rarely beaten Uganda in Kampala. The only time it happened was during the 2010 Elgon cup in which Kenya beat Uganda 33-25. During the first leg at Kasarani, Kenya dominated possession and territory but ended up giving up a second half lead to loose by a point. It was the execution that let them down, in particular the line-outs. Team captain Brian Nyikuli attributed the loss to loss of concentration. A second, less spoken about factor is that the raucous atmosphere that typifies matches at RFUEA grounds can hardly be replicated at Kasarani. To begin with, the crowds at Kasarani will always be smaller due to the fact that it is far from the City centre. And due to sheer the size of the stadium, large sections of terraces are plain empty. As a result, the atmosphere that visiting teams find intimidating and that favours the Kenya national team is missing. Thus gone is the massive home advantage that plays into Kenya’s hands. It is generally accepted by rugby fans that Nakuru RFC, the current kenya cup champions have the best players. It therefore came as a surprise when the national team was named with scarcley a player from that club. Worse still, it was a squad that was highly inexperienced with 11 out of 15 playing in their first test. The loss to Uganda at home left many fans wondering whether South Africa coach Jerome Paarwaters was even better than his predecessor, Michael “Tank” Otieno. When only minimal changes were made for the return leg in Kampala, many fans lost hope. However team Kenya regrouped and fough valiantly to beat the rugby Cranes in front of their own fans. Uganda had taken the lead 3-0 from a Joseph Aredo penalty. Kenya replied with two penalties from Kenny Andola. Uganda again took the lead via a Marvin Odong try. The score was now 10-6 Uganda. Isaac Adimo who replaced the injured Vincent Mose scored a try which Andola converted. Andola added another 3-pointer for a 16-10 half time lead for Kenya. In the second half, both teams scored a penalty each enabling Kenya to win 19-13. Kenya thus regained the Elgon cup on a 35-30 aggregate win. 2. Kenya had lost the 2012 Elgon cup by only 1 point. This entry was posted in Kenya Rugby News and Commentary, Kenya Sports news and commentary. Bookmark the permalink.